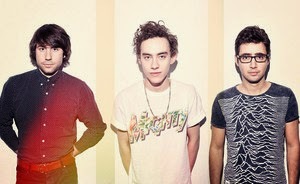 In January 2014, London electro-pop trio Years & Years released their debut single “Real” and started gaining hype across the internet. After this publicity, they signed to Polydor Records and released further singles “Take Shelter” and “Desire.” Twelve months later, in January 2015, the band have just won the BBC Sound of 2015, been nominated for the BRITS Critics Choice Award and have topped every single ‘Tops for 2015’ list going. They sold out their entire debut UK headline tour months before it even starts and tickets for their 2000 capacity London show in June sold out in ten minutes. Not bad for a band who’ve yet to release an album. Years & Years formed after beat makers Michael Goldsworthy and Emre Turkmen heard vocalist Olly Alexander singing in the shower and agreed to let him join their band. Little did they know that was the best decision they would ever make, as within months they became the buzz on every music lovers lips. Last year saw them tour with Sam Smith, Clean Bandit and MØ – plus Ellie Goulding has declared herself a massive fan. Still not persuaded? Years & Years have an utterly addictive sound, blending quick-snap beats and vibrating synths that provide the backdrop for choruses that demand your attention. Alexander’s vocals are something magical, powerful with a smooth R&B vibe that guides you through each track. Every song is endearing, offering something a little different to what came before it. “Desire” has an exotic feel to its rhythms, while latest single “King” has more of an 80s pop influence. Years & Years are the freshest band to have arrived in well, years (sorry) and with a seemingly endless tour cycle kicking things off for the band in 2015, plus the anticipated release of their debut album (When? We don’t know, but we do know we want it NOW), it looks like the next twelve months are going to be a ridiculous whirlwind and the trio are in for one hell of a ride.